Alexandria Ocasio-Cortez: Medicare For All Is Not A Short-Term Band-Aid But A Generational Investment - Joe.My.God. New York Democratic House candidate Alexandria Ocasio-Cortez said on CNN’s State of the Union that Medicare for All would act not as “a short-term band-aid,” but as a “generational investment” that would ultimately save the American people money. Ocasio-Cortez and many of the progressive Democratic candidates running in 2018 have made single-payer healthcare, which would cost about $32.6 trillion over its first 10 years, a central tenet of their campaigns. Polling suggests that a majority of both Democrats and Republicans support Medicare for All. “Medicare for all would save the American people a very large amount of money. And what we see as well is that these systems are not just pie in the sky,” Ocasio-Cortez said on CNN’s “State of the Union,” noting that Canada, France, the United Kingdom and other democracies have a similar form of health care. “What we need to realize is these investments are better and good for our future. These are generational investments,” she added. CNN’s Jake Tapper pointed out that some left-leaning studies have shown that the cost of Medicare for all would total close to $40 trillion. 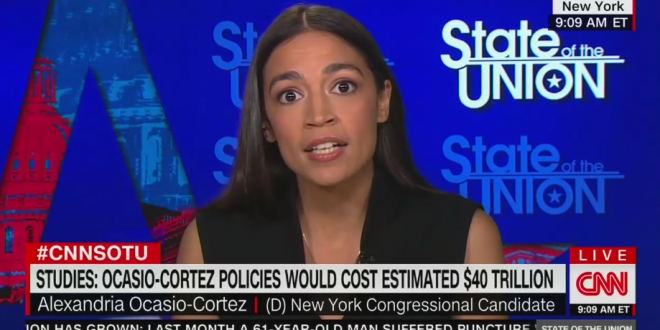 Ocasio-Cortez’s plan to increase taxes on the wealthy and corporations to pay for the idea would only cover about $2 trillion, Tapper noted.